Vinyl record aficionados know that quality is in the fine-tuned details. If you’re a self-proclaimed, audiophile, you’re probably invested in buying the best parts and accessories to complete your overall setup. Not all turntables require mats, but if yours does, you’ve probably noticed there’s a dizzying amount of variety on the market. It’s hard to pin down the difference between cork mats and rubber ones. You may also struggle to know what thickness to purchase. Here’s the breakdown on turntable mats, their benefits, what types are available, how to pick one, how to use it, and how to clean it. 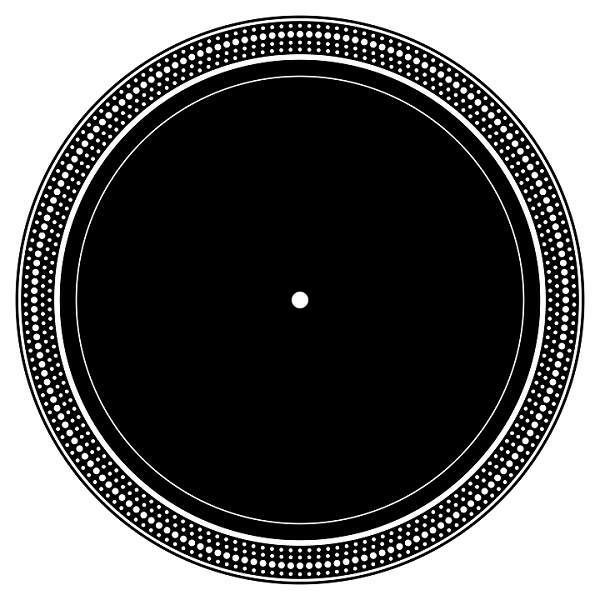 Depending on what turntable mat you select, it can help to dampen vibrations, reduce auxiliary noise, help avoid static, boost the resonance of the base, eliminate unwanted adhesions, drastically improve the clarity, and improve the overall sound quality (just to name a few possible features!). Apart from the listening experience, a good turntable mat is fashionable. When no music is playing, it’s the focal point of the record player, so it’s an added bonus if your mat features an appealing design. These designs can get quite fancy, and really add a flare to your setup. 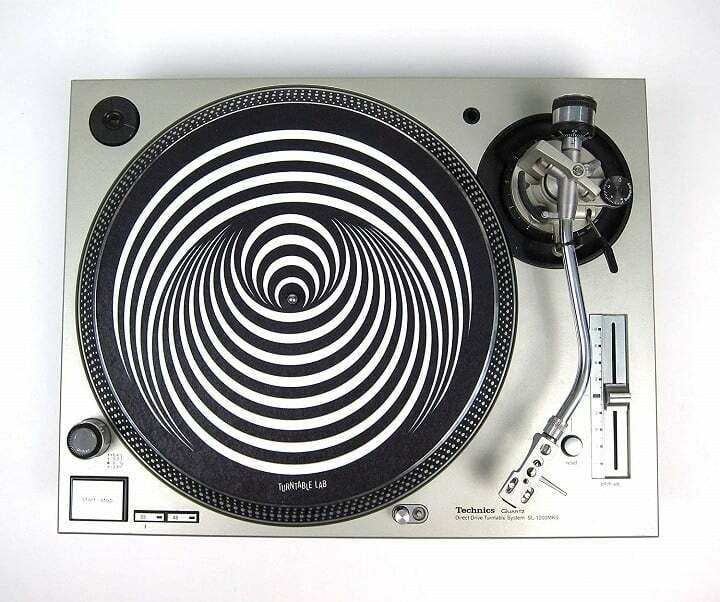 Turntable mats are often confused with slipmats. While a novice may mistake a slipmat for a turntable mat, there are several defining differences. When it comes to home record systems, slipmats are sufficient for those willing to settle. They’ll do the job, but they aren’t an ideal part of the perfect vinyl setup. Slipmats, unlike turntable mats, are sometimes sold in pairs. They are designed with the needs of DJs in mind so that a record can be cued and scratched, something that’s unnecessary for the average music listener. In contrast, turntable mat is a suitable product for those looking to perfect their record player sound quality and create the ultimate music-listening experience. For that reason, they are what will be covered in this guide. Depending on which type of turntable mat design, type, and material you select, you can seriously improve the sound quality of your records. For those seeking the ultimate listening experience, selecting the perfect turntable mat can be a bit tedious. Turntable mats are most commonly constructed out of rubber, leather, felt or acrylic. Each material has its own pros and cons, and which one you prefer will depend solely on your taste and your budget. Rubber is perhaps the most popular choice. It’s super effective at dampening vibrations, which is one of the main functions of a turntable mat. Additionally, the gripping properties rubber is known to make it extra adhesive which reduces slippage. Rubber mats are known to hold records in place firmer than any of the other mat materials. They’re also exponentially easier to clean than any of the other types of turntable mats, making them a popular choice for those wanting a low-maintenance, durable product. Leather turntable mats, like leather upholstery or leather clothing, are exceedingly fashionable. Their ability to reduce noise and static in addition to their classy look and feel make them a tough competitor for the position of the Cadillac of the turntable mat world. They’re also a staple for bass lovers, as they boost the overall beat and sharpen clarity to a fine point. Overall, leather mats are sure to provide a clean, clear sound, and a classically sleek look. Plus, their style just might match the decor of your tatami room. Felt is soft and gentle on the surface of your records. However, they are much more difficult to clean. The same properties that make felt a gentler option for a turntable mat, also make it a less durable option. Felt is a bit delicate and rips more easily than rubber, leather, or even cork mats. While you can commonly find turntable mats constructed of felt, they often serve better as DJ slipmats. Lastly, a felt mat can build up a static charge from spinning friction. So be careful when you touch it after using it – you may be in for a shock! Cork is a lighter, airy option that projects audio louder than other mats. It also dampens the resonance and helps to prevent slippage. The aerated holes open up the overall sound of the record, leading to a fuller, more robust quality. 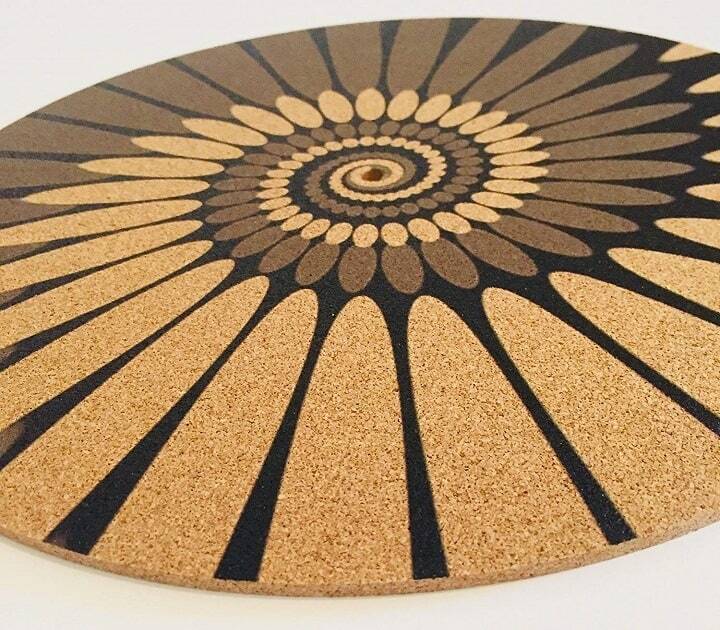 Additionally, cork turntable mats are non-stick in a gentle way. This makes them ideal for especially delicate records. Lastly, it can be noted that although cork mats are frequently the most affordable option, they also can tend to be too thick and prone to the creation of static. Turntable mats made out of acrylic cause the sound to reportedly be less “splashy”. This means the bass comes through tighter and more clearly, making for a sharper overall beat. 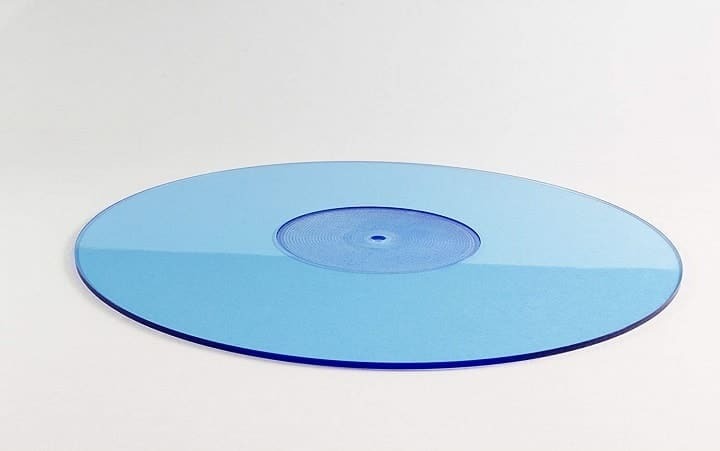 Because acrylic is a similar material and consistency to the record itself, it’s said to reduce overall vibrations. 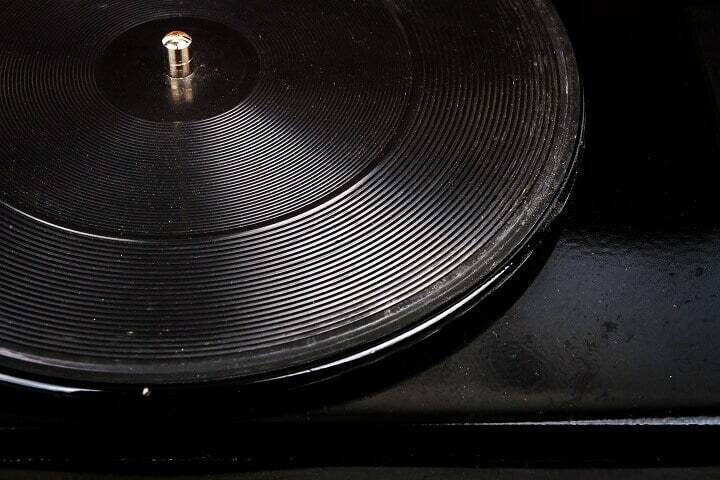 It makes for a clearer playback because the reduced vibrations allow the player’s needle to make better contact with the surface of the record. Now that you know the options for materials, it’s time to consider the other components of a turntable mat that can make it the perfect addition to your setup. Here are some things to think about when shopping around. After material, perhaps the most important characteristic of a slipmat is the thickness. Thickness varies. Which mat you select will depend on your record player and how it’s constructed, as well as what kind of sound you prefer. Some players have adjustable arms, which make the thickness of the slipmat simply a matter of feel and functionality. However, if the arm of your rig is not adjustable, you may be forced to be a bit pickier about the overall thickness of your mat. The density of the mat should place the stylus and arm of the record player are hitting the record at the correct angle. Sure, your first edition Abbey Road album is going to sound just as nice playing on a turntable mat that’s plain and black as it would on an artistically designed, eye-catching mat, but it’s not going to look nearly as fashionable. When your record player isn’t in use, the mat will be visible. While the primary purpose of a record player, its parts, and all of its accessories is primarily functional, that doesn’t mean it can’t be artistic or attractive as well. In fact, as much as your record player and records are is a functional collection for listening and enjoying, it’s also a dynamic contribution to your decor. It’s no wonder that design and print matters. Though it may not be the priority, some pick a print that appeals to the eye and fits with the home’s decor. Manifested often as a “fluttering” noise, record slippage can be prevented by selecting a turntable mat with a decent grip. Naturally, one of the most adhesive materials when it comes to mats is rubber. Felt, on the other hand, falls on the opposite end of the spectrum and is much more likely to slip. For some audiophiles, when it comes to their vinyl rig, money is no object. Nothing but the best will do. Meanwhile, other record aficionados may be working with a much tighter budget. When turntable mats can cost anywhere from around $30 to a whopping $350, there’s a lot of range in price and quality. The good news is that there’s probably an appropriate mat on the market for you, regardless of what your budget is. Who knows, you might be looking to save on your turntable mat and use the leftover money to accessorize your office with one of these best bamboo chair mat or durable glass chair mats, so you can sit back and relax while the record spins. Cleaning method depends vastly from material to material. Leather mats can be gently wiped with a dry towel. However, acrylic and rubber mats are by far the easiest to clean. You can remove dust and debris from their surface by simply washing them in a sink with a mild detergent (much like you might wash or hose off a salon floor mat). Felt and cork mats, however, are much more delicate. They require a dry cleaning method. Most people opt to gingerly brush away any dust or even sometimes use a vacuum. However, cleaning methods can be stressful especially on felt mats. For that reason, it’s suggested that you always keep your record player cover on when it’s not in use, in order to minimize dust collection. At the end of the day, no mat is innately superior. Everything is left up to the design of your record player, and your own individual taste. Different turntable mats make for slightly varying sounds. Objectively, these sounds are not better or worse, they’re just different. The only way to know which product you prefer is quite simply to take it for a spin, test it out, and listen for yourself. Photos from: VitalikRadko / depositphotos.com, Pepelaz / depositphotos.com.